Below is a step-by-step guide on how to properly set up and perform the hanging knee raise. Step 1: Grab a bar with an overhead grip, with the hands slightly wider than shoulder width. This can also be done in a Roman chair in which the lifter supports themselves by actively pressing to forearms downwards into the pads. Step 2: Press the thighs together, point the toes, and pull the belly button into the body. This position should mimic the hollow hold position. Be sure the the lifter has their arms fully extended and the head sitting in between the arms. Step 3: Once you have established body control and a flat lower back, slowly pull the knees to the chest, making sure to also pull the heels up towards the hips. In the starting position the toes should be pointing roughly 1-2 feet in front of you. Be sure to not lose back tension so that you can control body positioning and resist swaying forwards and backwards. Step 4: Once the knees have made it nearly to the chest, pause and contract the abdominals with maximal effort. The pause and contraction can help to increase muscle activation. Step 5: With perfect control, slowly lower the knees and legs in the same manner you raised them, making sure to not lose tension in the back and/or to lose body positioning. It is helpful to think about staying contracted and feeling the abdominals still working during this eccentric phase. Step 6: With the legs together and toes pointed slightly out in front of you, briefly hold and regain control of the body while hanging, then repeat for repetitions. If a lifter loses focus and/or does not control the entire range of motion they will start to sway and lose control, which is an indicator of improper form, technique, and/or utilization of core strength. Be sure to monitor beginner athletes to set a high standard for this exercise. What Is a Hanging Knee Raise? The hanging knee raise is a core exercise that is done while hanging or being supported (in a Roman chair) so that the legs and torso hang freely underneath the lifter. In this position, the lifter pulls their knees to their chest using the abdominals, obliques, and hip flexors in a controlled fashion. The hanging knee raise can be used as a bodyweight core movement that has application to more advanced gymnastic movements like hanging leg raises, toes to bar, and L-sits. The below muscles are worked by the hanging knee raise. The rectus abdominis runs longitudinally from the front of the pelvis to the sternum. These muscles are the primary muscles targeted by the hanging knee raise. The obliques are used to assist in the raising of the legs and stabilization of the hip/spine. In addition, the obliques can be isolated further with hanging knee raise variations (such as to the sides). The hip flexors are worked and assist the rectus abdominis in raising of the knees and creating hip flexion. 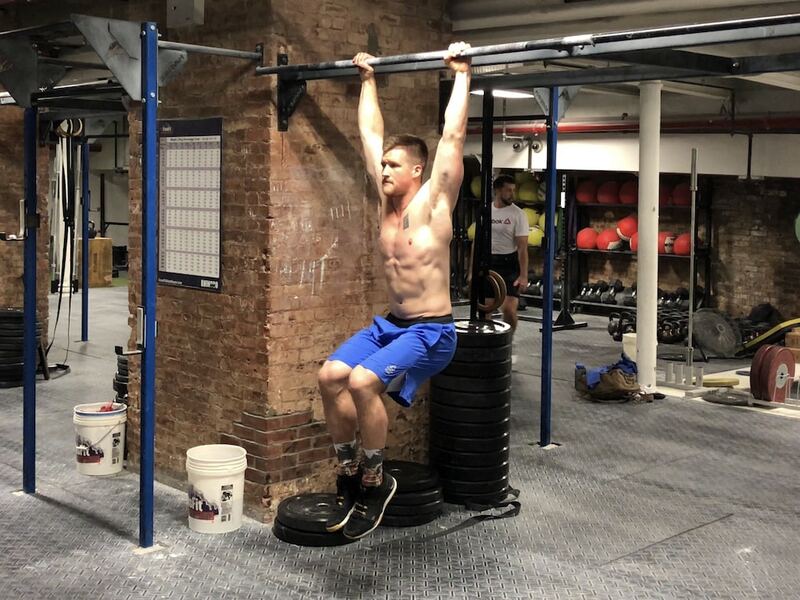 Hanging knee raises, when done from the bar (as opposed to the Roman chair) challenges the grip muscles and can be be a good way to build grip strength for more advanced hanging exercises. Below are three (3) benefits of the hanging knee raise. Increased abdominal size and strength is often an aesthetic goal of athletes and fitness-goers. The hanging knee raise, when trained and paired with a healthy diet that allows for decreases in body composition, can help to develop visual abdominals muscles. The hanging knee raise challenges midline control and stability similar to other hanging core exercise. A lifter must learn to control their body in space and not allow for excessive movement and/or excessive lumbar extension when hanging (loss of midline control). The hanging knee raise is one of the foundational movements that must be mastered if an athlete is looking to increase performance in toes to bar, L-sits, leg raises, V-ups, and more. Who Should Do Hanging Knee Raises? We break down who can benefit from hanging knee raises, and why. The hanging knee raise is a great core training exercise to build abdominal and hip flexor strength. Increasing basic strength and hypertrophy of those muscle groups can assist in movement like squats, clean and snatches, bracing, and more. In addition, fitness athletes can isolate the abdominals and hip flexors in a higher rep fashion if fatigue in more advanced movements is a limiting factor (such as fatiguing out the shoulders and body with high volumes of toes to bar and/or GHD sit-ups). 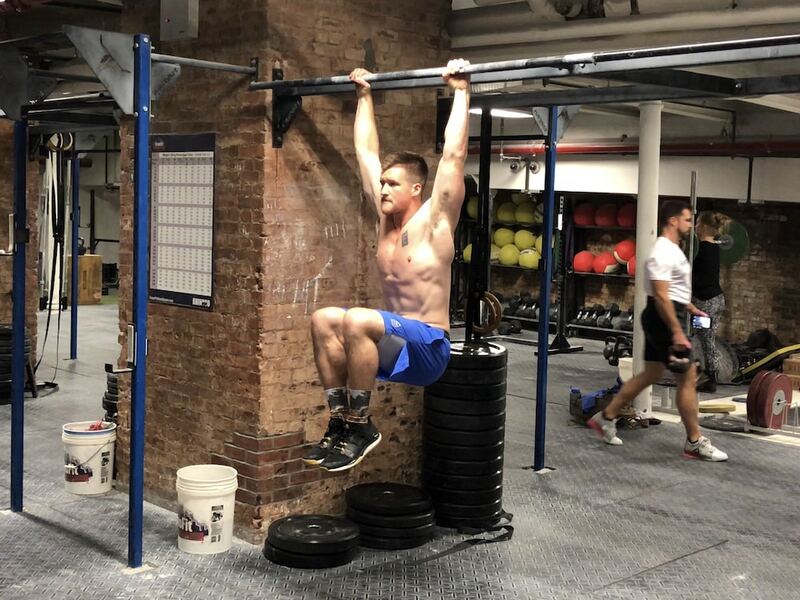 The hanging knee raises is a basic core strength movement that can be done by most endurance athletes to increase core strength, stamina, and hip flexor performance. All of these muscles are active in running, cycling, and swimming. 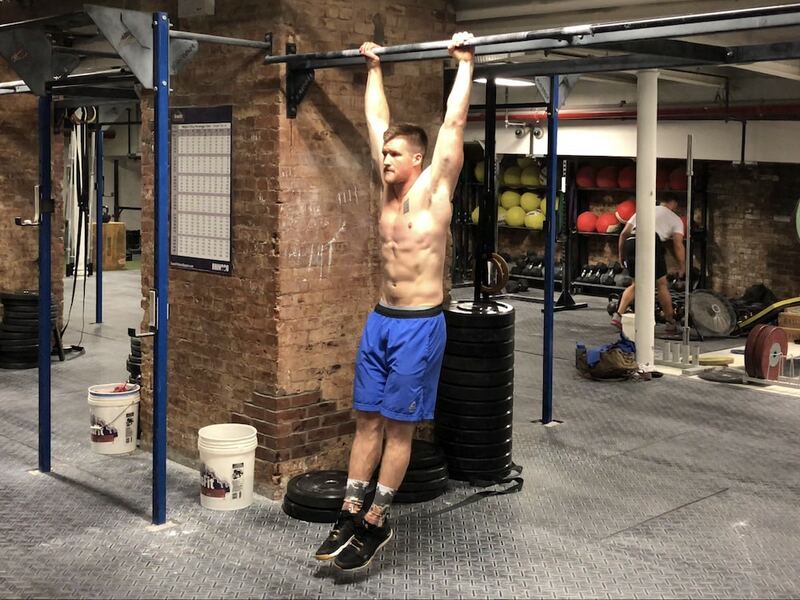 The hanging knee raises is a good movement for most fitness enthusiasts and entry-level lifters who may be looking for a movement that can target the abdominals without fatiguing out other muscle groups first. Sometimes more advanced movements will be limited not by core strength by grip strength, body control, etc; making the hanging knee raises a good way to target the abdominals with high volume. Below are common set and rep schemes to develop movement, hypertrophy, strength, and muscle endurance in the hanging knee raises. The hanging knee raise can be done with most fundamental level lifters (as long as they can support themselves hanging on a bar). The below rep schemes can be used to help them develop adequate body control and basic core strength. The below guidelines can be used to help increase muscle hypertrophy and abdominal development. The repetition ranges are broad and have the ability to be manipulated on a case by case basis. The below sets and repetition ranges can be used to increase muscle hydropathy and stamina for the abdominals and hip flexors. Below are three (3) hanging knee raise variations coaches can use to progress this exercise in most training programs. The hanging knee raise can be done using a tempo (cadence) to increase time under tension, instil greater body awareness and control, and enhance muscle activation in the abdominals. To do this, simply pull the knees up slowly at a set cadence (2-5 seconds), add a slight pause at the top (2-5 seconds), and then lower the knees down under control without losing tension (2-5 seconds). Repeat for repetitions. By adding a dumbbell, wall ball, or any other form of light load between the feet is a great way to add resistance to this movement. Weighted hanging knee raises can build abdominal strength and size. The hanging knee raise to toes to bar is a progression towards the toes to bar. One toes to bar method is to pull the knees to the chest and then kick the toes to the bar. You can read more about toes to bar in this toes to bar exercise guide. Below are three (3) exercises that can be great alternatives for the hanging knee raises. The lying knee pull-in is a slight regression from the hanging knee raise as the lifter does no need to support themselves as they hang on the bar. This can also decrease the amount of strength and body awareness/stability needed when performing the full hanging knee raise version, making it a good option for beginners and entry-level class formats. The lying tuck, also called the double crunch, is a foundational patterning that is used in most gymnastics strength training. It has application to the hollow rock position as well. To perform this, simply pull the knees to the chest and lift your chest to the knees, making sure that the lower back stays in contact with the floor. Lastly, be sure to do this in a controlled fashion rather than using momentum (such as throwing your arms towards your knees to assist in the movement). The leg raise is a progressed version of the hanging knee raise. In this version, the lifter keeps their legs straight (knees extended) throughout the full range of motion, making it harder. This is also a great way to build basic strength for more advanced movements like toes to bar and L-sits. I see there was a picture with Ab straps involved. Would you recommend the use of it? If so, any particular brand or model?